Nesting. Tons of pillows, blankets, stuffed animals, and one oversized, comfy recliner. Well, the recliner is interchangeable with wherever I currently feel safest. But for now it happens to be an oversized recliner designed to hold two people where I can completely surround myself with pillows and everything else that makes me feel safe. It's sort of a ritual, and the name came about because everyone who's ever seen me go through the process of building my 'nest' commented that I looked like I was building just that - a nest. It calms my nerves. Yes I know I seem so put together and in charge of my life online. Amazing how you can control what face you put forward online. Too bad it isn't that easy in real life. I'm actually a bundle of on-edge raw nerves most of the time. I don't cope that well with stress outside of my safe space. So, years ago, at the recommendation of a rather astute therapist, I started making my own safe space. My first nest was my bunk in my college dorm freshman year. High school wasn't easy and my transition to college was than smooth. I'd often bring a stuffed animal with me to therapy each week, and my therapist asked if it made me feel safer when I was holding it. To my surprise, I did. I was 18 years old and clinging to my stuffed animals for my dear mental life. I was embarrassed, and I think my therapist must have sensed that, because that was when she mentioned making a safe space for myself, filled with things that made me feel safe where I could relax. I will admit, I was...dubious...at first. How could a couple of extra pillows and some stuffed animals kept in one place suddenly make that place feel safer? Well...it worked. As to the why it works...who knows? Well, ok, I'm sure someone knows, but that person isn't me and frankly, I'm not really that interested. What does the nest contain? (1) NAP blanket (no really, that's what it's called! If you don't believe me click that link), which was a present from my husband shortly after we began dating and has been a fixture in my safe space ever since. It's pink, it's soft, and it's soothing. 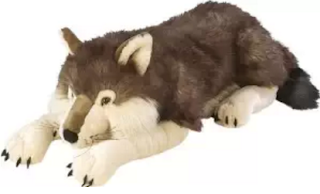 (1) oversized stuffed wolf, about 3 feet long. Until we can get a dog of our own, the wolf travels from bed to nest with me. Growing up we had a dog, and animals have always been very soothing for me. But, hubby and I have agreed we're not ready for a dog yet, and it wouldn't be fair to bring one into our family before we're both ready. When I'm really upset I'll cuddle and pet the dog just like I do my parents' real one. It sleeps next to me by my legs, just like my parents' mush Allie. (She's a german shorthair pointer and an absolute loveable mush). Remember being a kid and building a pillow and blanket fort? Think of this as the adult version of that. Only, without the furniture rearranging. It really is a great way to relax. Just make sure the space you use is dedicated to relaxing. Bed, a favorite chair, hell, a pile of pillows or cushions in a corner of the room. You can add whatever makes you feel calm and safe. I keep a tabletop fountain nearby with changing LED lights, both of which help soothe me. I have a lap desk should I want to watch something on my laptop, and a TV tray nearby for water, tea, snacks, etc. I cannot recommend this enough for making a wind down space. Rebuilding it everyday is a ritual I enjoy. Just building it I can feel myself slipping into a calmer headspace. What's your safe, relaxing space look like? Tell us in the comments!